Have you ever had a “WOW” moment? Something wonderful happens and suddenly everything changes. That’s how it was with Richochet the Surf Dog, a beautiful golden retriever. Ricochet was born to be a service dog. Her training began when she was a tiny puppy, learning how to help a disabled person. Ricochet learned to open cabinets and the fridge. She picked up dropped objects and fetched any item her trainer needed. Ricochet is loving and empathetic to a very high degree. It would have seemed that her path in life was perfectly laid out. Ricochet, however, wasn’t a perfect service dog. When she saw a bird, her retriever instincts kicked in and she just had to chase the bird. Judy Fridono, the Executive Director of the non-profit Puppy Prodigies, is a certified dog trainer with a degree in assistance dog training from Bergin Institute of Canine Studies. The intent had always been to place Ricochet with a disabled person, but Judy knew the bird-chasing would be a problem. More than two years went by. Just as happens with many people, it seemed that Ricochet’s career path was stalled. She was now too old to be placed with a disabled person. Things just weren’t working out according to plan. At the time, no one realized that Ricochet would have done very well if placed with someone with psychiatric disabilities, such as a veteran with PTSD. As things worked out, Ricochet has become a truly inspirational dog, helping many people rather than only one. Ricochet loves the water and joyfully learned to surf. In 2009, Ricochet’s “WOW” moment happened. She suddenly jumped on a surfboard with Patrick Ivison, a 14-year-old quadriplegic boy. This was what Ricochet was born to do. Puppy Prodigies honored Ricochet’s special gifts and created a unique role for her. She became a SURFice dog®. She actually keeps very busy filling multiple roles. This is why Ricochet is allowed on beaches and in other public places. Since finding her true path, Ricochet has spent hundreds and hundreds of hours working with the disabled. She has a special bond with kids and takes her duties very seriously, never “smiling” or relaxing until her surfing buddy is safely on shore. In fact, the only time she’s felt she could relax and stretch out on the surfboard was while surfing with champion surfer Rob Machado. Ricochet has received many awards for her outstanding abilities. She has been awarded the highest title a therapy dog can hold with the AKC. She’s a Distinguished therapy dog. Be inspired by going behind the scenes of Ricochet’s inspiring mission of hope. 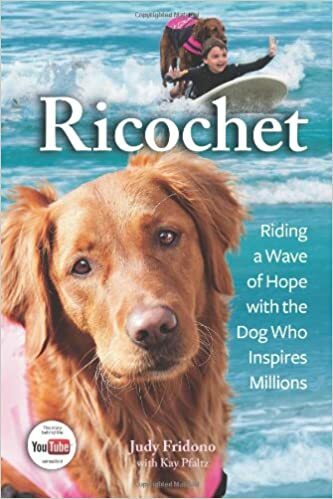 Read Ricochet: Riding a Wave of Hope with the Dog Who Inspires Millions and follow her journey. She traveled from promise to disappointment before discovering her true purpose in life, healing hearts and souls. Ricochet continues to amaze and inspire, teaching everyone a valuable lesson. When you find your true passion in life, follow your dream and your heart. Incredible things will happen. Ricochet brings joy and hope into every life she touches.